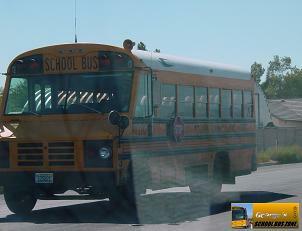 The last year CCSD bought this bus was in 1994 (the "Handy Bus"). Then they kept buying shorter versions of the Thomas Saf-T-Liner EF and Blue Bird TC/2000. This bus was mainly used for Kindergarten and Special Education transportation. I don't see this bus as much as I used to anymore on the streets. The smaller TC/2000 and Saf-T-Liner EF buses are used more. Location: Heading toward Stanford Elementary for afternoon pickup on Harris. Interesting Feature: One of the few buses to only have one stop arm.